Center-Stage is a series of articles spotlighting a particular model or unit in Godslayer; we return now to the Wyldfolk and look at the Warlord for the Tribal sub-faction – the Pendragon. With the keen senses of a dueling stag in the dawn’s mist, the cunning of a stalking wolf in winter’s snow and the agility of a pouncing puma in the forest’s sunset haze, the Pendragon is a true son of the wilderness. His life has been lived within nature’s verdant embrace and he remains ever awed by her beauty, communing with her at Samhain and Beltain through the Melding. As a typical leader of a wilderness village, the Pendragon personifies the exuberant spirit, independence values and rustic culture of the Wyldfolk. 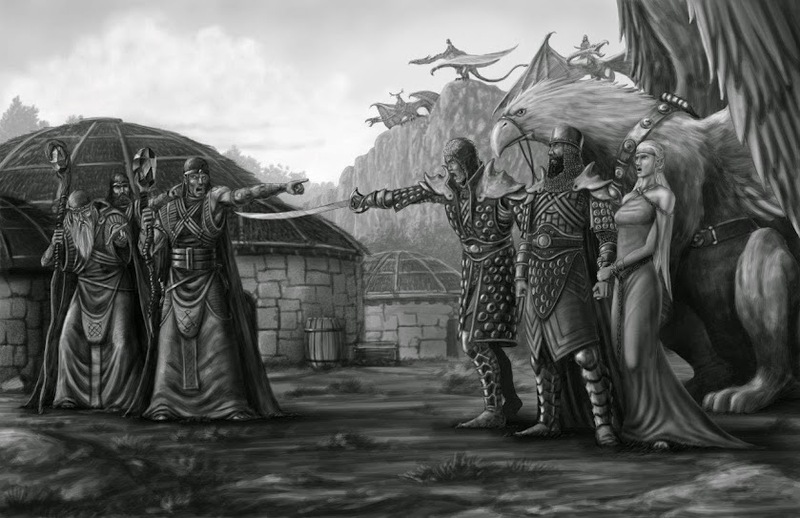 Since he or she is elected into their seven-year term of rule by the community, the Pendragon is generally the village’s favorite, and being a warrior society, that popularity depends on heroic deeds on the battlefield. In fact winning battles is the Pendragon’s primary duty, since a year’s bounteous harvest can be wiped away in an hour of conflict. Although an accomplished warrior, the Pendragon’s principle role during the chaos of battle is to corral his troops, for a Wyldfolk force is a beast composed of disparate elements requiring a handler with great finesse. Timing, deployment and cooperation are far more important for Wyldfolk than for most of their enemies who rely more on brute force, armor, or magic. When the beast works in unity, at the Pendragon’s command, it becomes a predator of distinction. These warrior-lords wear ring-mail armor and a greatcoat of brigandine, and have access to items enchanted by the druids. The Pendragon is a cultural heir of the Red Griffon Empire of Uthyr Songsword, and he wields the same traditional weapons of bows and swords as Uthyr’s Wyvern Knights (from whom his title Pen-Draig is also derived). Like the very breeze he is a master of stealth, shooting foes with bulls-eye accuracy as he glides unseen through the undergrowth. When the time is ripe he leaps forth, leading his warriors in a frontal assault with wild abandon. The Pendragon is an Infantry warlord of the Wyldfolk Tribal sub-faction. At 45 points he is a little more expensive than similar warlords, partly because he can make missile attacks. As you will see, the Pendragon is an all-rounder type of warlord who can do some buffing of friendly models and do okay in melee as well as shoot. He has a tremendous selection of items from which to choose and so he can be tailored for any mission. Let’s start with a look at the profile. MOV 3 – Normal movement for humans. MEL 7 – This is good when compared to most models in the game but certainly on the low side for warlords. It seems he is not cut-out for extensive melee combat. MIS 7 – Now we’re talking; the Pendragon is clearly handy with a bow. MAG 4 – Normal to low for a non-magical warlord. DEF 15 – Excellent; few models (even warlords) have DEF15. ARM 7 –This is the average level in Godslayer, but pretty low for a warlord. Clearly the Pendragon relies more on his agility rather than heavy armor. LEAD 9 – Low-average for warlords, but many have 10. So from the above we can gather that the Pendragon is light on his feet and agile, with pretty good skills in archery. Actually, as we shall see from abilities and tactics, the Pendragon is really not a serious combat warlord. He falls clearly in the “all-rounder warlord” category, which means he can do a bit of everything. Wyldwalker – The sub-faction ability of Wildwalker permits the Pendragon to move and charge through difficult terrain without the usual penalty of half movement. Wyldfolk warbands always profit from having some terrain at hand to hide themselves, and so it’s great when your warlord can ignore the hampering effects of most terrain. Combat Master – Pendragons are renowned heroes with tremendous combat experience. The Pendragon may choose a fighting style when performing counter attacks. A nice little bonus, but try to avoid long, drawn-out melees with the Pendragon. Dugout – Dugouts are prepared so that warriors can launch a surprise attack on the enemy. Before the setup phase, nominate one friendly model/unit. The nominated model/unit gains the ability Secret Deployment. This can be really useful in scenarios as it allows you to capture objectives very early. It also allows you to set up flank charges. Keep in mind that you can put an entire unit of 8 Bladeslingers or 5 Cromlech Guard in a dugout. It is particularly annoying for the enemy if you place all the hidden deployment markers inside forest or other difficult terrain. This forces them to expend a lot of action tokens to check each marker and often encourages to just leave them. Of course it’s no problem for your sub-faction troops because they all have Wildwalker and move at regular speed through forest terrain. Vanguard Valor – Leading from the front, the Pendragon incites his warriors to charge the enemy. If the Pendragon successfully charges an enemy model/unit, all friendly models that were within his LEAD range and which had line of sight to the Pendragon before he performed his charge movement, reduce the cost for charge actions against the same charged model/unit by one action token. This is great for buffing your units. Consider that this effectively gives a unit +1 ACT, then when you assign them an action token in addition, they end up with +2 ACT, which is usually enough for making an extra attack. So this ability would enable you to add up to 8 additional attacks for free, if for example used with a unit of 8 Bladeslingers. Just beware that the Pendragon is not a melee warlord so be careful in your placement of the Pendragon if he charges a unit (more about that later). Sneak – Annyr warriors are experts in stealth, able to sneak through the undergrowth when ordered. Target friendly model/unit gains +2 DEF against missile attacks. Sneak lasts until the start of the target model’s standard activation in the following round. This is a great tactic when advancing against missile warbands, especially against Mortans. Later waves of Godslayer will introduce more missile-armed models and so this tactic will become ever more useful. Sworddance – The Pendragon employs his advanced skills in sword-dancing, bringing death to his enemies in a whirlwind waltz of slashing swords. The Pendragon may roll one additional die on his melee attack rolls this round and then discards the lowest die before determining if the attack was successful. So even though the Pendragon has a low MEL skill for a warlord, this tactic can boost it nicely. Wylde Charge – The Pendragon gets his warriors’ blood boiling and spoiling for a fight. When charging, target friendly model/unit gains an additional +1 for melee attack rolls this round. A tactic which is very useful throughout the game. So the Pendragon has 2 tactics for buffing troops – one being defensive and one being offensive, and he has two abilities that help his troops – Dugout and Vanguard Valor. The Pendragon has access to 5 different types of items – a pair of swords is his weapon choice, an armor item, a potion, a talisman and a bow. Okay here’s something to bear in mind: with every sword pair, the Pendragon has the ability Ambidex-trous fighter, so for the cost of 3 ACT he can make 2 attacks. This means he can make 4 attacks per round with 6 ACT. So although he is not the greatest melee warlord in the game, he can still be effec-tive in melee, and can be tooled-up to perform as an adequate melee warlord if you want. Ivory Cutlasses – POW3 and costing 4 points. This is a good option if you want to play your Pendragon primarily as a shooter instead of a melee fighter and just want a melee weapon as a back-up. It is also possible to play him without a melee weapon….but I would advise against that! Elm Falchions – Same as above but more expensive with POW4. Bloodleaf Blades – Each time the bearer causes damage to an enemy model through a Bloodleaf Blades attack, it immediately gains a cumulative +2 POW for its next Bloodleaf Blades attack action until the end of the current round. This is awesome. Since the main weakness of the Pendragon’s attacks is the power, this is a nice solution for that. Note that this is cumulative, so he could end up with +4 POW on the 3rd attack action of that round, which would be POW7. Outstanding! That re-quires 9 action token to pull off, but is possible when using the Megalith and Potion of Speed. Note: if the Pendragon is making ambidextrous attacks, both attacks count as a single action, so you don’t get the +2 for every attack. If he uses normal attacks, the POW bonus can go up even faster. With the Megalith an potion of Speed, it is possible for him to have 10 ACT in one round. That’s 5 attacks using the 2ACT attack option, which could potentially result in POW11 for the 5th attack. Monstrous! Sisters of Sorrow – The bearer may re-roll one attack die once on each Sisters of Sorrow attack roll. Not bad, but keep in mind the Pendragon has the Sworddance abilty which has a similar effect. And this item costs 12 points. Actually the two work well in combination, so this is an expensive option ideal for some special stratagems (discussed later). Longbow – Suffers no -1 POW penalty when shooting at long range. This one has a 12 inch range and POW3 but costs 3 ACT for each shot. Nevertheless, this is still pretty cool since it has a long-range of 24 inches and still hits with POW3 at that range. Awesome for taking out characters and thinning the ranks of lighter units. Beltain Bow – The bearer may draw line of sight through models, and target models do not benefit from screening or being in cover. The bearer may also target models which benefit from Concealment. The ultimate sniping bow. With this you can target those pesky spell-casters hiding behind heavy infantry! Even Warlords etc who have Concealment cannot hide from this one. The Beltain Bow can really ruin your opponent’s day! Feylock Bow – Does D3 direct damage in addition to the normal damage roll. Pretty cool when facing heavy troops like Legionnaires and Einherjer etc., and also good against Warlords! Since all bows are items, their attacks are enchanted and thus ideal for taking out ethereal and spectral models. Hauberk of Anthalon – The bearer gains +2 ARM but counts as heavy infantry/cavalry. However, keep in mind it reduces him to a maximum of 9-inches movement per turn. If you intend to keep your Pen-dragon out of melee this one can protect him from occasional attacks, spells and arrows, and is also pretty useful if he finds himself in melee. Cloak of Serpent Vines – The bearer gains +1 DEF and the ability Advanced Deployment. This neat little item allows you to deploy your warlord 18 inches onto the table (where he can target the enemy with his bow from the very first round!). It also increases his great DEF of 15 to an awesome 16. Girdle of Mabhdus – 4+ protection roll to reduce damage in half. Great in every situation. Mammoth Leather-Kilt – The bearer gains +1 DEF and +1 ARM. This is the outfit for your Pendragon if you intend to tool him up to be a melee warlord, making him ARM8 and DEF16. In Wave-1, the Pen-dragon is the only model in Godslayer which can have DEF 16 throughout the game. Even warlords with MEL8 need an 8+ to hit him. Mistletoe Juice – Once per game the bearer ignores any effects of toxic continuous effects and all those currently affecting the bearer immediately end. This is cool when facing Mortans and Banebrood since it will protect you against Poison, Paralyze, Toxic Spit, Gas and plagues. For 2 points its worth taking even as an insurance. Glade Water – Once per game, lasting until the end of the current round, a target model/unit adds +D3 direct damage for melee damage rolls against ethereal, demonic, undead & spectral models. This will have many more uses with future waves of Godslayer, but right now it is useful when facing Magistratum and Shadow-Troll warbands. maximum of its starting value. The standard healing potion. Perfect for paranoid or hypochondriac players who want to protect their warlord at all costs. Actually it is quite useful if you prefer to play defensively. option. Not bad. This one is useful and will give your Pendragon an 11-inch charge range (even if he is wearing the Hauberk of Anthalon that makes him Heavy Infantry). token pool. Nice! However, something similar can also be achieved by taking a Megalith in your warband. Taking both can be devastating. +2 MIS, and +2 DEF. A „one-hit wonder“, but when you combine this with other items, tactics and spells it may be all you need to decapitate the opposing warband. Fire Dance Sporren – The bearer may charge through friendly models. Pretty cool; this can be a big, nasty surprise for your opponent. Faerie-Fire Wreath – The bearer always counts as being in cover. Gives you +2 Def against shooting attacks. Clearly that’s great when facing shooty warbands. round. Doubles your charge bonus so the Pendragon effectively has MEL9 and POW5. Not bad, and can be really nasty as part of some combos. the bearer may order one tactic (costing up to 1 ACT) to a friendly Tuathan sub-faction model/unit for free each round. This is a really compositional item – meaning its usefulness depends on the compo-sition of your warband. On the other hand, causing Fear is never bad. Thornwall Seeds – Once per game, place a difficult terrain object with a sight value of 1, measuring 3” in length and 1” in width, anywhere within LEAD range of the bearer at any time during its activation. The object remains in play for the rest of the game. With this item you can effectively block a charge of the enemy assuming your models are sight-value-1 models (on small bases). This can seriously frustrate the opponent’s great plan to charge with his buffed elite unit. This is probably the most potentially game-changing item in this list. If you plan to play your Pendragon as a Buffer warlord, then this is almost a must. are applied, the player may remove another friendly model within 4” of it instead. When doing so the bearer’s life-points are immediately set to 1. An absolutely perfect item for a melee warlord. But be sure to keep a stock of Bladeslingers nearby to sacrifice. Verdant Tattoos – The bearer gains the ability Concealment. Concealment is a great ability since he cannot be targeted or charged by any model more than 6 inches away. Offensive Melee Outfit – All-out offense! Defensive Melee Outfit – For those who want their warlord to live forever. Sniper Outfit – The sneaky and ruthless option to cause death from afar. Buffer Outfit – To make your warlord best suited for enhancing your warband. All-rounder Outfit – A useful kit if you want to be flexible, for example for tournaments. Sneaky Outfit – The perfect bag of tricks for long-range and close-up devious tactics. Bladeslinger Outfit – ideal if you want your Pendragon to lead a warband composed of Bladeslingers. Several models in the Wyldfolk Warband have useful synergies with the Pendragon. • Bard – The Bard’s song Legend Lore can be used to buff the melee attacks of the Pendragon (avoiding spending the Pendragon’s valuable action tokens) with either a +1 to hit or +1 damage. Remember that this is a talent so does not count as a tactic, in this way you can combine it with tactics. More importantly, the Bard’s Victory March can allow the Pendragon to make long-charges. This is an incredible benefit not to be underestimated. • Ovate Grove Druid –the druid can help the Pendragon with many of his spells: Caendra’s Caress can be used to heal the Pendragon; Flurry of Leaves can hide him with a haze effect; Fury of Mabhdus can be used to increase damage in melee, Swiftness of Aridhia can increase his Strike Rank allowing him to fight first, and Omens is always useful, providing either +1 to hit or +1 damage in melee. For improving shooting there is Hurricane Winds (+1 POW for missile attacks) and Fury of Mabhdus (roll 1 extra damage die and discard lowest). Also possible is Breath of Stromnath (+2 range for missile attacks). At 18 points each, Druids are a great deal, and even their spells are quite cheap. In a large warband of 350+ points it makes sense to take 2 of them. 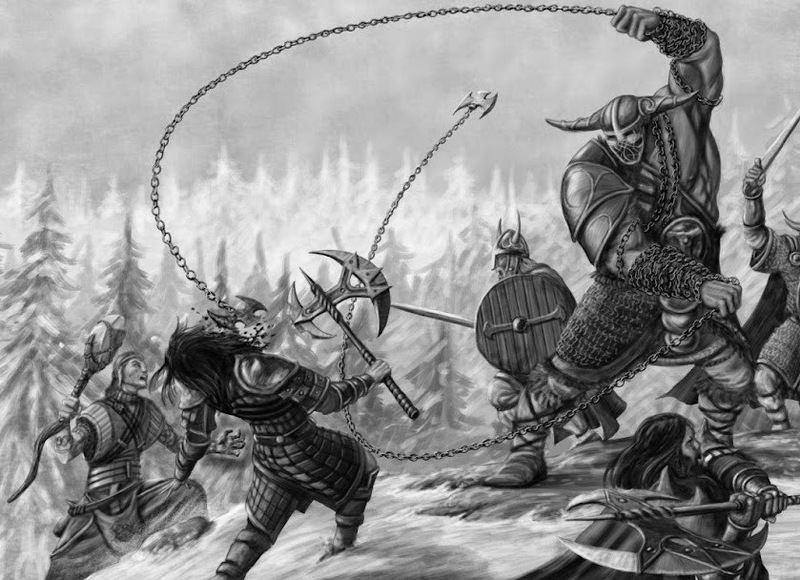 • Bladeslingers – Perhaps the best warlord to take with a Bladeslinger-based warband is the Pendragon. Bladeslingers are versatile, being fast, armed with a missile weapon and a 2-inch range melee weapon. The Pendragon’s Wylde Charge tactic can be ordered to the Bladeslingers, giving them +1 to hit in a turn they charge. Combine this with his Vanguard Valor ability, and any unit he charges can be charged by the Bladeslingers for one less ACT. When he also assigns the unit an action token, this means they can make 3 melee attacks each in a turn they charge, at RNG2. That means up to 24 melee attacks at +2 to hit and +1 POW due to the Wylde Charge and the charge bonus. Combine that with the Druid’s spell Fury of Mabhdus, and you have a cheap unit which can easily massacre enemy elite units. • Cromlech Guard also benefit from the same sub-faction ability and are very good melee fighters. There exist really dozens of stratagems and roles the Pendragon can perform. Indeed this is part of his character – versatility. For that reason he makes a good Warlord when you have no idea what kind of force you will be facing. Combining all their various stratagems you can get a huge number of possible strategies to plan around. Below you will find a few strategies which came to my mind, but with extensive play you will find many more. This is a partial repeat of the “Classic Plan” in the Bladeslingers article, but this version is expanded to show how you can use the Pendragon as a key part of the strategy. You will also need some units of Bladelsingers preferably of 6-8 models as well as a Megalith. Place the Ogham Megalith 14 inches from your table edge and near the centre of the table or in a reasonably open space nearby. This open space will be your kill-zone. A classic use of Bladeslingers is to advance them forward at full speed so that they are within MIS range of the enemy on turn 2, perhaps even turn 1 if the enemy moves very fast. Use your Bladeslingers to pelt the enemy using their missile attack while withdrawing and luring the enemy into the kill zone. Deploy one unit of Bladeslingers 16 inches from your table edge using secret deployment, granted by the Pendragon’s Dugout ability. Deploy the Pendragon 16 inches in with advanced deployment (because of the Cloak of Serpent vines). In his first turn, he should store 2 action tokens in the Megalith then shoot twice at the enemy. The Bladeslingers deployed with secret-deployment can do nothing in the first round and the other unit should move forward 12 inches. The average enemy will now be around 4 inches from the centre of the table after having moved 4 times. If the enemy is slow, then this strategy works better. You can also slow-down the enemy if you get lots of difficult terrain between the Pendragon and the enemy, because even if he goes around such features, it should still cost him movement to the side instead of straight forward. Remember that each missile attack of the Bladeslingers is announced separately one after another, so you can attack the same target with several models until it is dead, then move on to the next one. With a POW of zero (due to long range penalty) they are not fantastically powerful, so try to use them against your opponents’ lightest troops such as Maldire Mongrels, Kinswords, Xisteri Bombers, Reaver Tribesmen, and Gnoll Reaver Runts as well as creatures and characters with low ARM scores. Sometimes the threat of the missile attacks is even more effective than the attacks themselves. Use your Druid to channel the spell Hurricane Winds (+1 to damage) or Fury of Mabdus (3D6 dice for damage, and remove lowest) on your Bladeslingers through the Megalith. This will improve their performance. Your Pendragon has Wildwalker ability, so he can move almost as fast as the Bladeslingers, but he can only move up to 4 times per turn. This should not be a problem because his bow has 4 inches more total range. As the opponent advances, you should retreat by moving twice, enabling you to make one shot per turn with the Bladeslingers, and 2 shots per turn with the Pendragon. Try at all times to keep some difficult terrain between you and the enemy (but not forest or you will block your line of sight). Remember that with your Wildwalker ability you can cross difficult terrain at normal speed but most enemy models cannot, so keeping difficult terrain between you and them greatly decreases the chances that they will charge or engage you while you fall back and hammer them with stones. After two or three turns of this, the opponent should be in your kill-zone and your forces will be around 4-5 inches from your table edge, so try to position your Bladeslingers so that they are 12-13 inches from the nearest enemy unit or creature. If you have two units of Bladeslingers, then that’s even better, because even if you lose the priority roll in the next round, your opponent is going to be faced with some bad choices. Make sure the Bladeslinger units are located on either side of the kill-zone, at least 8 inches apart so the enemy cannot engage them both if he goes first next round. Be sure to put your Bladeslinger units in Hedgehog to give them DEF 14 until their next standard activation in the following round. In this way, you will be harder to hit in case your opponent attacks them before you activate them next round. Your Pendragon should be placed next to one of the Bladeslinger units, but use 1-2 models to cover him from potential charges. A) If the opponent wins priority next round… he can only activate one model/unit and your Bladeslingers will be outside of his charge range in most cases. The best he can do against your Bladeslinger units is to move 4 times and try to engage one of them. By doing so he uses up all or most of the action tokens of the unit and therefore cannot attack you. In that case activate the Pendragon and assign your Bladeslinger units an action token each. Then give the unengaged unit of Bladeslingers the ordered tactic Wylde Charge and perform Sword Dance on the Pendragon. Now charge the Pendragon into an enemy unit /warlord. This should preferably be a new one, not the one which engaged your Bladeslingers, but if there is nothing else in range, you can charge that unit. Remember with the Elixir of Vigor, he can make a Long Charge, so has a charge range of 11 inches +1 inch MEL range. His charge is, benefitting from +2 MEL and +2 POW for charge bonus and Boar Mask of Danaiden. After draining the 2 action tokens from the Megalith he now has 4 ACT left, so he can still make 4 attacks. Remember that his Ambidextrous ability allows him to make two attacks as a single action during the charge, so he has two attacks to kill the target, and then gains Slay-Movement, allowing him two extra free attacks! So in total, he will be able to make attacks at MEL10 and an escalating POW that starts at 5, then POW6 (the bonus of the mask counts only for initial attacks). If you use the single (2 ACT) attack the bonus can reach POW8 for the last attack, at the cost of a maximum of only 3 attacks that turn. Next activate your unengaged Bladeslingers and charge something tasty, preferably the unit which the Pendragon charged (assuming there is still any enemy models left alive). In that case the Bladeslingers benefit from the Pendragon’s Vanguard Valor tactic, and so expend 1 less ACT on the charge. That together with their assigned ACT will enable them to make 3 attacks each with charge bonus and Wylde Charge, so MEL7 and POW4. Remember their charge range is 11 inches +2 inches MEL range. With your unit of Bladeslingers that was engaged by the enemy, move them once to position them so that you have two Bladeslinger models engaging one enemy model, then make two melee attacks with all models in that unit. Unless you are facing models with an ARM of 10 of higher, always chose Offensive fighting style to gain the +1 MEL to greatly increase the number of hits you score. B) If instead you do gain the priority in the critical round…then charge your Bladeslingers into an enemy unit or creature. Try to choose target units with low-medium DEF and/or ARM values. Position your models so they are more than one inch away from enemy models that have RNG1. Try to get two or more Bladeslingers engaging 1 enemy model to concentrate your attacks, especially when facing high-ARM models or models with many LP like Ogres or Trolloth. Also try to engage other enemy models and units if possible in order to bind them and prevent them from charging. Once you have placed your models, make your attacks, remembering your charge bonus, so that you are attacking with a MEL of 6 and POW of 4. After making your round of attacks, use your tactic Hail of Hornets to rob the engaged unit/model of one action token. Since the enemy loses 1 ACT and also must spend one ACT to get into MEL range (due to their 1” weapon range), they will probably make only one attack, even if assigned an action token from their warlord. After this, make your second round of attacks (still remembering the charge bonus remains in effect also for these attacks). After the opponent’s turn, activate your Pendragon, buff the other unit of Bladeslingers and charge with him. Follow that with a charge from your other Bladeslinger unit. This can also be accomplished with Scabhta Hunters and Beasthunters, but you will additionally need a melee unit for the coup de grace, and of course it works better for the farfarer because he has the same subfaction….so this strategy outlined above is a MUCH cheaper option and a perfect synergy of Pendragon and .Bladeslingers. The Warband will also need a unit of 5-7 Bladeslingers, a Druid, a Bard and a unit of Cromlech Guard, plus a unit of Scabhta Hunters. The Cromlech Guard and Bard plus Scabhtas should advance forward in the first round and form up with the Cromlech Guard just in front of the Scabhta Hunters and spaced so that the Scabhtas can shoot between the bases. Try to form up inside some difficult terrain (make some scrub or rubble pieces for your gaming board). If you do this, the enemy must spend extra movement to charge you, but because your Cromlech Guard benefit from their subfaction ability Wildwalker, they can charge at normal speed. One particularly good stratagem is to place Bladeslingers with secret deployment using the ability of the Pendragon warlord called Dugout. In this case, it is advantageous to place the secret-deployment tokens (especially the token where they are really located) inside difficult terrain, but not far from the edge. As enemies approach, activate the unit and reveal them, then charge them out of the difficult terrain at any kind of opposing model or unit. Be sure to place them more than one inch away from the enemy so that you are engaging but not engaged by them. After performing initial charge attacks, use your Hail of Hornets tactic on the enemy model/unit and then withdraw back into the difficult terrain using your maximum movement. Because of your Bladeslingers’ 2-inch range weapon, your models will not count as engaged by the enemy and so you may move away without suffering free-strikes. Assign the Bladeslingers an action token from the Pendragon, so they can move further. Having moved either 6 or 9 inches away and deep within difficult terrain, the enemy will be unable to charge you (unless they have Wildwalker ability). Having robbed them of one of their action tokens, the enemy model/unit is unlikely to spend its remaining action tokens slogging through difficult terrain to engage you. But if they do, they will almost certainly have no action tokens remaining to attack your Bladeslingers. While the enemy is marching across the table being harassed by your guerilla Bladeslingers, your Pendragon should be with or near the Bladeslingers to support them. Use your Pendragon to shoot squishy expensive targets like spell-casters, ethereal models (your bow has enchanted attacks), characters and creatures with low ARM. Remember that your bow can target models even behind the bases of opposing models, so you should be able to wreak havoc with two shots per turn. Deploy at least one Druid near your Bladeslingers and Pendragon to support them. Focus of casting spells on the Pendragon such as Hurricane Winds (+1 POW for missile attacks) and Fury of Mabhdus (roll 1 extra damage die and discard lowest). This will make his shots more devastating. The Scabhta Hunters should use every opportunity to shoot the approaching warband. Use your Cromlech Guard for the core of your warband, and as the enemy closes on them, use Bladeslingers to rob enemy units of action tokens and to make supporting attacks. Finally, make an unexpected long-charge with your Pendragon using the Elixir of Vigor and pin the main enemy unit. Support him with Bladeslingers if there are any left. Use the Bard to give the Cromlech Guard the ability to make a Long Charge (using his song Victory March). They will now have a charge range of 11 inches. Activate Circle of Death and charge with your Cromlech Guard. March across the table and position your Cromlech Guard 10-11 inches from the enemy. This will be outside the charge range of most enemies, especially if you place them behind the difficult terrain. Since your Cromlech Guard has the sub-faction ability Wildwalker, they can move over difficult terrain at normal speed. Imagine the enemy 10 inches away and maybe 6 inches of difficult terrain. They would need to move an effective distance of 16 inches to reach your Cromlech Guard. Use the Bladeslingers to make a long charge and pin the enemy’s best unit and creatures/warlord. Now activate your Bard, use Victory March on the Cromlech Guard. Assign the Cromlech Guard 1 ACT from the Banshee. The Banshee can then harass some models with her magic attack. Activate the Cromlech Guard and perform the tactic Circle of Death, then charge the unit the Pendragon charged. They can make a long charge because of Victory March, and they had 7 ACT. The charge costs 1 less ACT because of the Pendragon’s ability Vanguard Valor (so they effectively have 8 ACT). Now the Cromlech Guard suffer -1 MEL and -1 POW because of Circle of Death, but this allows them to attack every enemy model in MEL range, so place them in range of as many enemy models as possible. Be sure to give them as many targets as possible, including characters, creatures and the enemy warlord if possible. The charge bonus cancels out the -1/-1 penalty, and they have +1 MEL from the Wylde Charge tactic ordered by the Pendragon. So each Cromlech Guard can attack every enemy model in range at MEL 8 and POW 5, then they can do the same again! If you manage to pull that off, you will have made a serious dent in the enemy from which they probably will not recover before the end of the game. You will also need a Druid as your Pendragon’s “spotter”. Position your Pendragon 1-inch inside some forest terrain. 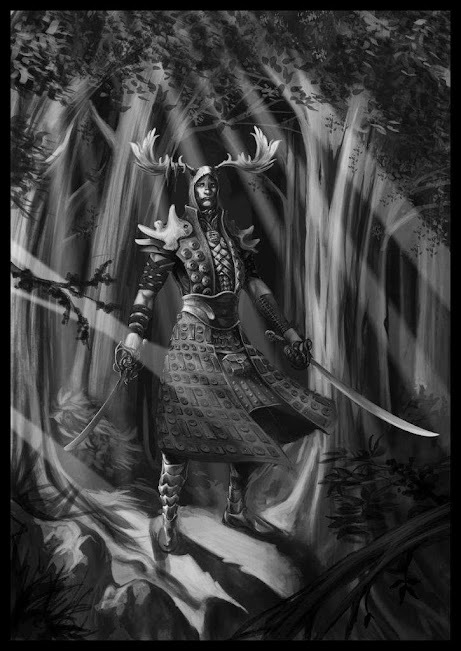 Because of Verdant Tattoos he will anyway benefit from Concealment, but the forest prevents him being flanked and offers an escape route in case a serious unit comes after him (with Wildwalker he can move through forest at normal speed). Use your Pendragon to shoot squishy expensive targets like spell-casters, ethereal models (your bow has enchanted attacks), characters and creatures with low ARM. Remember that your bow can target models even behind the bases of opposing models, so you should be able to wreak havoc with two or three shots per turn. The Druid should be casting spells on the Pendragon such as Hurricane Winds (+1 POW for missile attacks) and Fury of Mabhdus (roll 1 extra damage die and discard lowest). Also possible is Breath of Stromnath (+2 range for missile attacks). When you get a nice opportunity, drink the Dexterity Draft, increasing your MIS to 9! When you combine that with the two damage spells and two or three shots, you can kill a character in a single round. If your Pendragon inflicts enough pain, the opponent may send something his way to deal with him. If it is a serious threat, then try to draw the enemy unit into the forest where it will waste its time moving at half speed. This is a strategy combining shooting with a defensive line. This is a strategy that most of the Wyldfolk Tribal sub-faction is not designed for, since their specialty with their Wave-1 models is fast offense, and you can get much better results using such strategies. However, you can try this for a fun alternative sometimes! Why not! 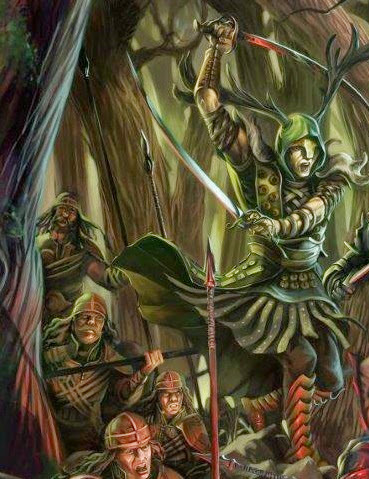 For this one you should take an Ogham Megalith, a unit of Cromlech Guard, a unit of Scabhta Hunters, a unit of 4 Bladeslingers, 2 Druids and a Banshee. Fury of Mabhdus and Leyline Flare. Set up the Megalith 10 inches from your table edge. In the first round, move your Cromlech Guard forward and line them up in front of the Megalith and within 5 inches of it. Allow gaps in the line for Scabhtas to shoot through. Keep the Bladeslingers in reserve, 3 inches behind the Pendragon. The opponent will most likely be moving all of his models forward as fast as possible, which means they will mostly be 16-24 inches from his table-edge now. Assign the Scabhta Hunters an action token from the Banshee. Position the Pendragon in the Cromlech Guard line (moving twice) and shoot once at the nearest enemy model. Assign one action token to the Scabhta Hunters and store one ACT inside the Megalith using Time Vault. Move your Scabhta Hunters up behind the Cromlech Guard by moving twice, so they should be now around 12-13 inches from your table edge, which means the enemy will be around 20 inches away (which is still within their long range. Activate the Scabhtas as the last unit of the round and perform the tactic Bow Veteran (increasing your chances to score a critical hit. Shoot the nearest and fastest enemies. Shoot with the Beasthunter and Bladeslingers. Buff the Scabhta Hunters with the Druid. Assign the Scabhta Hunters an ACT from the Banshee. Put 2 ACT inside the Megalith using Time Vault with the Pendragon, then shoot twice with him. Finally, shoot twice with the Scabhta Hunters. With all shots at MIS 7 and POW 4 they should be able to wreak some havoc. Now the enemy should be pretty close. If they are within charge range, and you get the chance, then charge them. If the enemy charges your models, then they will hit the Cromlech Guard and your warlord. Remember the Cromlechs have the ability Defiant in Death which means dead models get removed at the end of the round, so do not counter-attack yet. Your Warlord will have DEF16 and ARM 8 and a 6+ protection roll plus a healing potion restoring 5 life-points plus the ability to resurrect. This means he can absorb a lot of attacks. If the approaching enemy is mostly low-level, cheap troops then position him so he can be engaged by 3 models. If elites are coming over the horizon, then he should be in a position to be attacked by only two models. It’s fine for him to attract a lot of attacks because he will be soaking up attacks that would otherwise go onto your Cromlech Guard. Remember your Cromlech Guard benefit from a 6+ protection roll assuming you placed them within 5 inches of the Megalith. After the enemy tsumani has passed, you will probably have some dead Cromlech Guard who are still standing. If your Pendragon dies, then assign the death to one of the reserve Bladeslingers using the Soulswap Gem. If your Pendragon is killed after the Cromlech Guard have activated, then you can remove a dead Cromlech guard instead of your Pendragon. Cast Fury of Mabhdus (best 2 of 3 damage dice) and Omens (+1 MEL and +1 POW) on the Cromlech Guard. Cast Leyline Flare on the Banshee and Omens on the Pendragon. 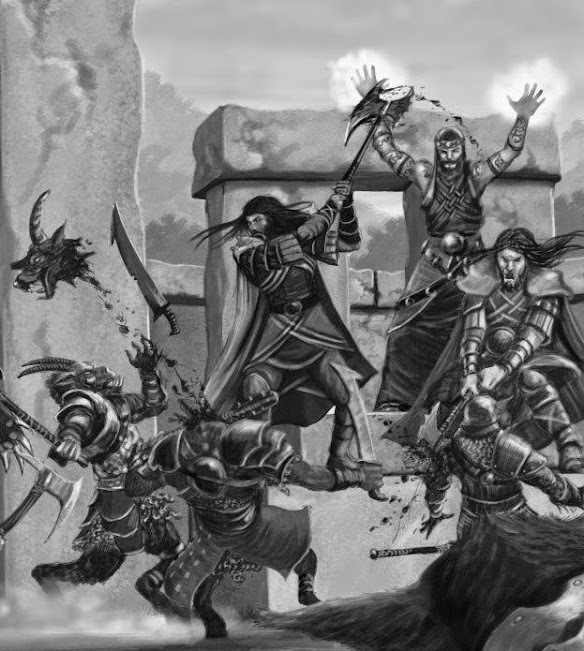 Leach 2 ACT from the Megalith with your Pendragon and attack and use Powerful fighting style (Sisters of Sorrow swords allow you to reroll one die of each attack). Activate Sword Dance (allows you to roll 3 attack dice and remove lowest). So you will be rolling 3 dice to hit, rerolling one if you wish and removing the lowest. It will be a miracle if you miss with any attack (plus you have a noticeable higher chance of scoring a critical hit, inflicting 3 ponis of direct damage in addition to the normal damage roll). So make your 2 ambidextrous attacks then use 1 ACT to reposition the Pendragon then make two more attacks. Assuming the Omens spell was cast, your Pendragon will have MEL 8, so you will probably hit with all 4 attacks, and with a POW of 5. Follow up with an Assault from the Scabhta Hunters and a charge from the Bladeslingers. Count all the models that were destroyed this turn within LEAD range of the Banshee (including your dead Cromlech Guard still standing and any enemy models). The Banshee now gets that many vitae tokens (up to a maximum of 6). Use her tactic Kiss of Death to position the 3-inch template over any group of enemy models within LEAD range (move twice if you need to). Now boost the Kiss of Death with 3 vitae tokens and make a POW damage roll against all models beneath the template. Finish with a Soul Screech also boosted by 3 vitae tokens. Try to target the enemy warlord if possible. Because of Leyline Flare your Banshee will now have a MAG of 8. Assuming she hits, roll 3D3 direct damage. Finally remove the dead Cromlech Guard. • Against Beastspawn sub-faction it may be best to use the “Wall of Death” strategy because they can outrun and out-maneuver even the Wyldfolk. • Use lots of difficult terrain on the table! • Equip your Pendragon according to your strategy. • The Pendragon has the ability Dugout for a reason – because it is beneficial, so be sure to use it unless your strategy really does not match. The Wyldfolk faction was inspired by Celtic mythology, and having Celtic ancestry myself, they were one of my pet-favorites during development. The Pendragon was inspired partly by Fionn mac Cumhaill, CúChulainn Dark Age Britain & Ireland and Robin Hood, but more so by the mythology, geography and history of the Godslayer cosmos. In my opinion the Pendragon has far more Wyldfolk than Celt in him. This warlord was a little tricky to get right. He needed to embody the general principle of the Wyldfolk – light guerrilla warrior and also have missile attacks. In rules terms, missile attacks are basically melee attacks made with a very long weapon, and so they can easily become overpowered. Therefore it was necessary to make sure the Pendragon was not too awesome with a bow, and for that reason he gets no magic arrows (the Farfarer does because he is more squishy). At one time the Pendragon did have a few more abilities/tactics, but after a year of testing all the warlords, we decided they had too many rules and that this would make the game less accessible to beginners. So we went through and stripped off all the least iconic special rules. We didn’t want the Pendragon to be a mega-melee warlord because that would make him very expensive in combination with his missile attacking skills. Nevertheless, we also did not want him to be a total wimp, so we gave him high DEF and low arm. His MEL makes him decent in an average fight, but not a match against most melee warlords. Somehow the Wyldfolk came out with a huge number of items to chose from. Some are situational but many are generally useful. The reason for this was simply that I was inspired mythology and just had too many ideas. I always assumed we would drastically reduce them, but that just didn’t happen. In the end, we found this extensive choice of items fit the faction perfectly and helped to give the Wyldfolk warlords a little something to make them unique and also helped them compete against other faction warlords which were generally more meaty and fighty. So the items remained. The Pendragon is a jack-of-all-trades and a master of none. If you really grok that, then you will be able to understand how to use the Pendragon most effectively. He is perhaps the most versatile warlord in Wave-1 of Godslayer and because of that he provides endless hours of challenge and fun since he makes the entire warband versatile.